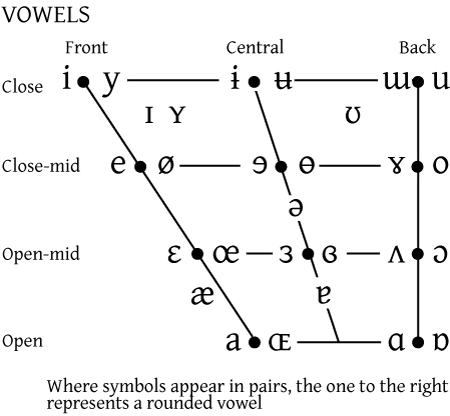 Years back, an actor asked me a dialect ‘riddle’ of sorts: is there any vowel represented by the International Phonetic Alphabet that does not exist in any accent of English? Conversely, it’s worth noting that we represent many English vowels with IPA symbols that don’t entirely correspond with their pronunciation. For example, we denote the General American ‘a’ sound in ‘father’ with the symbol ɑ. This indicates an open, back vowel, a bit like the ‘aaaaah’ you make when you yawn. Most accents, however, feature a vowel that is in fact pronounced with the tongue somewhat more front in the mouth: those with the fully back ɑ are probably in the minority. So as the last two paragraphs suggest, to say that a vowel ‘exists’ in an accent is to make an overly vague statement. But taking a quick glance at the IPA Chart, my tentative impression is that there are very few vowel sounds that don’t occur in at least some accents of English. Even the exotic front rounded vowels get some play (for example, in the New Zealand pronunciation of ‘nurse’). With all of English’s vowel shifting, it’s not surprising that the rarest of phones appear on the lips of Anglophones somewhere in the world. I’d say if there is one sound even arguably unheard of in English accents, it’s that represented by the IPA symbol ɯ — a sound essentially like the pure /u/ heard in Spanish or Italian, but without rounded lips. Even in that case, I’m not so sure: this vowel appears in some dialects of the Irish language, so I wouldn’t be surprised if some types of Irish English use it as well. But this might be a meaningless quest: IPA symbols don’t have an easy one-to-one correspondence to the sounds they represent. So as much as I hate to say it, the original question is perhaps unanswerable. This entry was posted in English Phonetics and tagged new zealand accents, phonetics. Bookmark the permalink. I think [ɯ] probably occurs in some accents of English as a realization of /u:/. My own /u:/ actually has very little rounding. I remember someone mentioning a long time ago on John Wells’ phonetic blog that /u:/ in the Upper Midwest of the United States stays back, but has a tendency to unround, which would be [ɯ]. Aha! Here it is (last comment). It’s also the same topic you covered very recently. I’m surprised you didn’t say [ɶ] (the low front rounded vowel). That’s what I would have said. Can you think of an accent that has [ɶ]? In accents where there is little lip rounding, my impression is that we’re talking about less lip rounding, not an entirely unrounded vowel: obviously, it’s more of a continuum than two absolute qualities. Entirely unrounded GOOSE would strike me as odd in Upper Midwestern English, but I’m not entirely sure. [ɶ:] is sometimes used to describe a realization of the GOAT vowel in South African English. It’s also mentioned as one of the realizations of NURSE in Welsh English. The problem here is that [ɶ] can arguably be used to describe two sounds: an open-mid front unrounded vowel AND an open front unrounded vowel. The latter is not an identifiable phoneme (yet), otherwise I definitely would have a hard time thinking of any accent that uses it. Linguists often aren’t even talking about actual rounding of the lips when they refer to “rounded” sounds. They’re often just referring to a certain quality, which may be achieved by other articulatory configurations. I thought [ɶ] was used for an open front rounded vowel and [œ] for an open-mid front rounded vowel. The symbols look similar, but they aren’t exactly the same. I’m also sort of confused because I didn’t think we were talking about phonemes; I thought we were just talking about surface realizations of phonemes. No big deal though. I just come here for kicks and giggles. Sorry, Tom, realized that for some reason the symbol I used came out as [ɶ] instead of [œ]! (Sometimes when I cut and paste certain IPA symbols, wordpress goes with the ‘uppercase’ version). And compounding the problem, your [ɶ] came out as an [œ] on the comments section of the site’s admin section … sorry for the confusion! 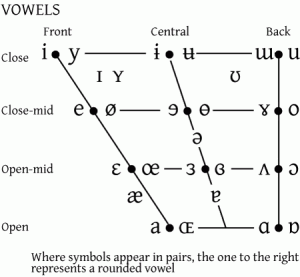 Why isn’t there a devoted symbol to the central open unrounded vowel? I used to think that all my “short-o” sounds were [ɑ], but now I’m sure it’s centralized. I maintain [ɑ] for a few words like “all” [ɑL]. Wikipedia uses /ä/–why is it never fully included in charts? Because no language is known to contain a distiction between /a/, /ä/, and /ɑ/. /a/ is usually used to represent the central vowel, no real disambiguation occurs in doing so. He (or she) said “other than”. Read that one a bit too fast! Anyway, as I mentioned above, Oceanic/Southern Hemispheric accents tend to have front-rounded vowels for the ‘nurse’ vowel, particularly in New Zealand, as does (traditional) Geordie. Check out the Pittsburghese video here for a sample. [ä] for the vowel in ‘lust’ seems a little too open for California English. The STRUT vowel is definitely fronted, but usually more toward the vowel in DRESS. I live in California and have never heard [a] in “last”. Do you have an audio example? Lust *can* range from [ə~ɜ~ɐ~ä~ʌ], and Lost from [ä~ɑ~ɒ~ɔ], so theres large allophonic range. The Last range is [a~ä]. Lust with [ä] does indeed sound too open, but it can occur allophonically on occasion. [ä] for Lust can be commonly found in pittsburgh though. I’ve heard that the “lot” vowel in California approaches more towards /ɔ/. Do you use the same vowel in Paul-pol-Hong Kong-long song-collar-caller-lot-God? Yes for everything except “pol,” which takes [o]. Oh, and Paul takes [ɑ]. But it doesn’t. Dialects are funny, aren’t they? Hong Kong long song collar caller lot God merge to [ä] (as does politician), so I’m not a low back merged accent. It’s only the ALL words (all, Paul, etc.) that take [ɑ]. Note that “call” takes [ɑ] while “caller” takes [ä]. “Pol” and “Sol” take [o], rhyming with “poll,” but not “pole” and “soul,” which take [oʊ]. So, you’re from the Great Lakes area, right? In that song ”Move like Jagger”, the lead singer’s (Adam’s) pronunciation is closer to j[a]gger than to j[æ]gger. I’m pretty sure that working class Glaswegians have [ɯ] for [i] in some contexts. I remember being at a wedding reception in Scotland where I mistook a request for a bin as a request for a bun. Ladefoged said that there were almost no examples of any languages ANYWHERE that use ɶ. The one language that got it into the IPA is a rare dialect of Swiss German. I do not believe that there are any English accents that use it. Sure NZ has a fronted rounded vowel for NURSE, but not ɶ, which is far too open. hey there and thank you for your info ? I’ve certainly picked up anything new from right here. I did then again expertise some technical issues the usage of this web site, since I skilled to reload the site many occasions previous to I may just get it to load properly. I had been puzzling over in case your web hosting is OK? Now not that I’m complaining, but slow loading instances times will very frequently affect your placement in google and can injury your high-quality score if ads and marketing with Adwords. Anyway I am including this RSS to my e-mail and can look out for much extra of your respective fascinating content. Ensure that you update this once more very soon..